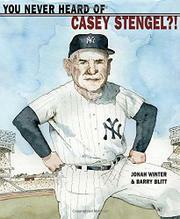 Casey Stengel was a baseball phenomenon and a genuine eccentric. He was a good—though not great—player, known for his goofy antics, such as hiding a sparrow in his cap and, when fans booed him, tipping his cap to release the bird. At the end of his playing career, he became a manager for a series of terrible minor and major league teams. Then came the New York Yankees, with their full roster of great players. He managed them to 10 pennants and seven World Series championships. All those years prior, he had been studying the game carefully and remembering everything. His innovative style of platooning lefties and righties, switching around his lineup, placing players at multiple positions, and keeping everyone guessing won games and became the template for the modern game. He also had a way of speaking that confounded all listeners, using “Stengelese” to great advantage. Winter speaks directly to readers in a colloquial, folksy voice, presenting the salient facts but focusing on Stengel’s larger-than-life persona. Additional bits of information appear in sidebars designed like tickets. Blitt’s softly colored pen, ink, and watercolor illustrations, in a variety of perspectives, perfectly convey Stengel’s baseball world, and the portraits of Stengel are amazingly accurate and lifelike.